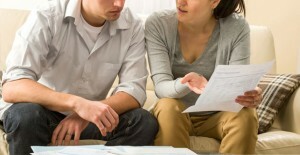 Home » Living Room » What affects your credit rating? There are some things that will obviously affect your credit rating; failing to make payments, and overloading yourself with debt and County Court Judgments (CCJs). You probably already know that these will affect how much of a risk future lenders think you are. This may sound bizarre, but not having any credit history can be a reason for a poor credit rating. Until you’ve successfully shown you can manage a debt, a lender has no way of knowing if you are likely to make your repayments. That’s why some debt-free folk, as well as those recovering from a period of bad debt management, often use a credit builder credit card. By clearing the debt in full each month, they prove they can be trusted. No, lenders don’t care who you support in the General Election, or whether you vote at all. What matters is that you are registered to vote as this gives lenders proof of address. It’s really easy to register; you don’t even have to wait for a form through your door. Visit http://www.aboutmyvote.co.uk/ to find out how to sign up. If you want a loan, the answer is not to apply for every loan you can see until a lender agrees. Every single time you apply for credit it leaves a footprint on your credit record and making a lot of applications can make you look risky to potential lenders. If you’re planning to apply for credit then check you are likely to qualify before signing up, and only apply to one at a time. Do you share any financial products with a partner? Maybe a bank account, a mortgage, a home-improvement loan? If you do, then your finances are linked and this can mean that lenders look at your partner’s debt history when they are considering lending to you. If you’ve broken up with a partner then it’s a good idea to close down any shared accounts and to clear any shared debt as you are likely to be both jointly and severally liable. That means they can pursue you for the whole amount even though it is a shared debt. The most important thing to remember is that you can fix your credit rating. It’s not a solid thing; you don’t have a black mark against your name for ever just because you struggled with debt at one point in your life. A credit rating is fluid and taking control of your debts will see your score gradually rise. Even former bankrupts can build their score back up by managing their money carefully for a few years. If your debts seem out of control and you’re being hounded by creditors then talk to us. PayPlan offers free debt advice and we promise there are no hidden fees or nasty surprises. We also never judge our clients; we’ve heard it all before and will simply help you rebuild your finances and stop worrying about debt. Do remember too that there is no such thing as a black mark – this is shorthand but really credit scores are numbers from which creditors make their decisions to lend. Those with the best credit ratings are those who borrow and pay back regularly, on time with the full contractual payment or more. These can also then be those who are affected by a sudden income shock. So beware of borrowing up to the hilt.